*Weigh the beetroot before grating. Make sure that the amount of vinegar used is at least a third of the weight of the beets, to ensure preservation. I’m always liberal with the vinegars, just in case. **In my latest batch of Beetroot Relish, I used a cup or so of freshly squeezed orange juice to top up the liquid as the relish cooked. I reckon this might add another dimension to this already sublime relish! Heat about 2 tblsp olive oil in a heavy based saucepan, adding the mustard seeds and stirring until they pop. Add the remaining spices and cook until fragrant. Then add the sugars and stir over low to medium heat until dissolved. Add the beetroot, horseradish and orange peel, stirring to combine. Pour in the vinegars and water (I rarely use water, preferring more vinegar instead), covering the beetroot mix. Bring to the boil and then reduce heat and simmer for up to two hours, stirring regularly. To avoid burning, use a stove mat under the saucepan. In the meantime, sterilise your jars in a 150 degree oven. 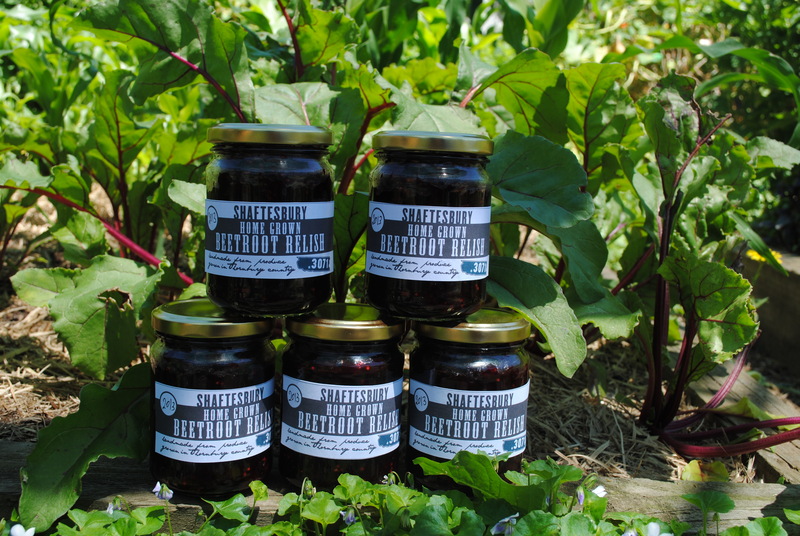 Depending on the size of the beetroots, you’ll get between 5 – 8 jars. Two and a half kilos of beetroot, for example, makes about 10 x 250ml jars, and you can multiply the other ingredients accordingly. You’ll know when the relish is done, as it will have reduced to a glorious, dark purple colour and most of the liquid will have cooked off. I always leave a bit of liquid; again, to ensure there’s enough vinegar for preservation. Remove the strips of orange peel, pour the relish into the sterilised jars, then seal. Hi Julie, Cooked beetroots are fine to use. I’ve started doing so myself as raw is very hard on the food processor! WOW!!! this is the best recipe. I have tried out many beetroot relish recipes over the last few years, but none of them was quite right. This is perfect. I haven’t even got it in the jars yet (it’s still simmering on the stove), but I had to comment. I have also added it to my pinterest board and will be commenting there as well. I cut out the castor sugar and used lemon instead.. still fantastic. I really love this recipe, it’s totally delicious. I’d like to know if it’s possible to halve or even further reduce the amount of sugar to alter the level of sweetness but still achieve preservation? Hi Sophie…approx how much would the 6 beetroot weigh please? What is horseradish relish ? Can you buy it from Coles or Woolies? Hi Lynda, I usually buy it from a Mediterranean supermarket or health food store but it is probably available in Coles or Woolies. Do not use the horseradish cream – rather, look for the product which is pretty much grated horseradish in brine. Hope that helps. Thanks very much for the recipe Sophie! I came across big fresh beetroots at the Vic market in mid november and and set myself the task of making your relish as presents from the larder. I hadn’t made beetroot relish before and it turned out really great (though I didn’t use the horseradish and subbed mixed spice for cloves). After 6 weeks of mellowing it is a lovely fresh and balanced relish … great for use with cold meat and salad. My friends have used it to top rissoles and served it with gravlax…yumbo gumbo! It will now be a constant to make for summer eating. I am always a touch skeptical when I come across ..”the best… ” however I have to say this recipe produced the most delicious beetroot relish I have ever tasted. Now a retired chef/cook I rarely had the time to indulge in this kind of cooking, but now I have been making jams and preserves for 18 months or so. I used a food processor with a grater disc that resulted in fine strips and went straight to fresh orange juice instead of water. I forgot to buy the horseradish relish, but had some fresh ginger and used that instead. The end result 7 (approx 150ml) Vegemite jars. Up my way (Kyneton/Castlemaine I have noted for months that the price of beetroots stubbornly hover around $4.99 a kilo, but for those close enough to Kangaroo Flat near Bendigo, I bought my large beetroot for $1.99 a kilo from the Cabbage Patch adjacent Lansell Square. One more batch to make for Christmas presents. Thanks for the great review Grant! I’m glad my hyperbole stood up to the test. The use of ginger instead of horseradish has me intrigued and I may very well try this in my next batch. Thank you so much for this recipe. It really is the best. We had it last night with grilled chicken burgers and garlic aioli……num, num!!!! I noticed you said to sterilize the jars in an oven at 150 degrees. Do you place the jar in empty and how long do you leave them in the oven. Also, when you put the hot relish into the jars and place the lids on, does the cooling process seal the lids on tight and prevent air from entering? Yes, rinse the clean jars in hot water and place in the oven, empty, at 150 degrees for about 30 minutes. As to the lids, soak them in boiling water and drain. Once you have filled the jars with the relish/chutney/jam, clean the lip of the jar with a clean damp cloth, then lid the jars. Lids should be as tight as possible. Another way to ensure sterilisation is to place the jars upside down once you’ve put the lids on, but this is just an additional assurance and not necessary. Sometimes I do it, sometimes I don’t bother. And yes, the cooling process seals the jars. You might even hear them ‘pop’ as the process takes place. Hi Ley, Just grate them fresh, as they are cooked in the process of making the relish. As above! Grate them fresh, using a food processor if you have one. I made this relish yesterday and its really tasty, I think the best batch I have made. Can I store my filled jars in a cupboard or does it need to be in the fridge. I was thinking with the amount of vinegar in it, its just like a chutney and keep in cupboard. Hi Di, Before opening, you can store any preserves or chutneys for up to two years (or more, really) in a cool place. Once opened, all preserves and chutneys (not pickles mind you) should be refrigerated. I made this beetroot relish yesterday, and it is fantastic. I forgot to get an orange so used Lemon instead.